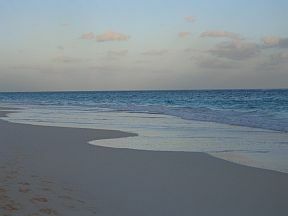 Bermuda Beaches – pink sand, crystal clear blue water – you gotta love it! I've spent alot of time on the beach in Bermuda, either swimming, snorkeling, having a picnic breakfast or dinner, or just strolling along them and enjoying the tranquility and connection with nature that is unavoidable. It's difficult to pick an absolute favorite, as each beach has its own unique qualities and features, and as you'll see from the pictures, they are all a little piece of Nirvana! 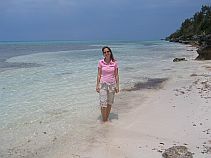 Bermuda beaches are covered with a beautiful sand tinted by flecks of pink shell. The sand itself is limestone based, finely ground into tiny particles by the action of the ocean currents pounding the coral reefs. Coral itself is limestone based, the shells of the coral polyps; the tiny marine animals which form each individual piece of coral, are comprised of Calcium Carbonate, or in laymans terms, limestone. When the coral animal dies, yes coral is a living animal, the shells are ground up into tiny particles and washed up onto the shores. The pink tint is given by the shells of Foramanifera. Forams, as they are commonly called, are tiny marine creatures found in a wide variety of habitats. They are not animals; they lack not only a number of animal characteristics, but also the photosynthetic capabilities of organisms such as plants or algae. So, biologists consider them neither plants nor animals, and they are placed in a separate kingdom, with a number of other groups of bizarre creatures. The shells of the Foraminefera may be spherical, a flat circular shape, tubular, or some other odd shapes, and range in size from about one tenth of a millimeter in diameter to well over an inch in diameter, but most importantly they are pink in color! They are very abundant and quite common around the reefs of Bermuda and consequently when the Foram dies, it's shell is washed up on the shore along with the limestone sand, and the shells of other dead sea creatures such as crabs, scallops and oysters which give Bermuda beaches their unique sand. 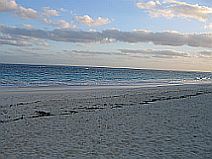 The best examples of pink sand on Bermuda beaches can be found on the South Shore beaches, especially Warwick Long Bay. If you happen to be visiting any of these Bermuda beaches, scoop up a handful of the sand and you'll notice the tiny fragments of pink shell mixed right in with the sand itself. 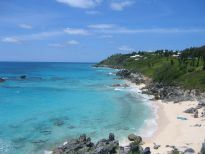 Located on the border of Warwick and Southampton parishes on the South Shore of Bermuda is the mother of Bermuda beaches, the world famous Horseshoe Bay. Tourists and locals alike flock here in the summertime, however this beach is never overcrowded due to its size. They maintain full facilities here, a snack bar, showers and toilets, though we prefer taking our own food rather than eating the "nuked" fast food you'll get here. Not that we don't like fast food, sometimes we indulge, however the quality here is not so great. During the summer evenings they have begun to host different forms of entertainment, from live concerts and the like with both international and local acts, to outdoor movies which is a really unique and cool change from the cinema. It's great for swimming, as it is shallow close to shore and calm most of the time, however as along all of Bermuda's beaches on the South Shore you need to be aware of occasional rip-tides. Rip tides are created when the wave returns from the beach back to the ocean. The current created by the force of the returning water can drag you away from shore for a distance. The main thing when being caught in a rip tide at is not to panic. Swim parallel to the shore, and you'll soon be free from the current. You can easily spot the rip tides as the sand from the beach is quite stirred up within them. If you do get into trouble, there are lifeguards posted at all of Bermuda’s public beaches during the high season, from May till the end of September. 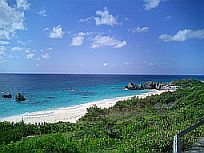 The occurrences of rip tides at Horseshoe Bay or other Bermuda beaches are very sparse and seldom are there any serious incidents. You can also walk from Horseshoe Bay to Long Bay in Warwick through about a half mile of sand dunes, an area that houses multiple surprises and treasures in the form of many beautiful and secluded coves. Most famous of these is Jobson's Cove, however being the most famous it is also the most visited. The best time to enjoy these coves is in the early morning or evenings when they are mostly deserted. Daniela and I often went in the mornings for a picnic breakfast and swim or in the evening after 6pm for a barbecue or evening meal. They are secluded though, so never take any valuables, as opportunists roam the beaches looking for someone who has left their cameras or wallet unattended while swimming. Exercising this common sense at all Bermuda beaches will ensure your experience is a completely pleasant one. Warwick Long bay is, as its name implies, located in Warwick parish, and quite long! 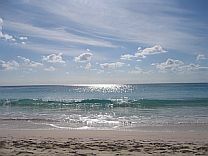 It's one of our favorite Bermuda beaches for taking long evening strolls, but it is also excellent for swimming. Close to shore is shallow in some spots, so great for kids, but there are areas where the depth drops off quite suddenly and steeply. There are also coral reefs close to shore, which makes for some great off-shore snorkeling. You'll see coral of course, but also lots of Parrot fish, Pompano, Sgt. Majors or Cow Pilots as well as a multitude of Yellow Grunt, Squirrel fish and the like. As I mentioned previously, you can walk along the sand dunes between Warwick Long Bay all the way to Horseshoe Beach, two of the most beautiful of Bermuda beaches. In the summer months there is a concession stand opertated at Long Bay, where you can buy a burger and a cold drink. Church Bay is the best of all Bermuda beaches for offshore snorkeling. It's ocated a mile or two towards Somerset from Horseshoe Bay on the south shore if you're riding mopeds. If you're traveling by bus, the number seven bus will drop you off right at the entrance. Only 50 metres off shore is a vast array of coral reefs and marine life which you can spend hours absolutely enjoying. If you want to lose track of time and immerse yourself in nature's bounty, this is a great place to go! It's very protected from waves due to the coral reef barrier, and during the summer months there is a small concession stand where you can rent snorkeling equipment and other water toys at very reasonable prices. Church Bay beach and Park gets a four thumbs-up from us! At the western end of Southampton parish close to its border with Sandy's or Somerset parish is Whale Bay. 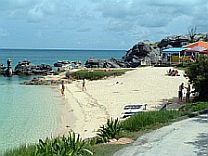 Whale Bay is very popular with locals in the area, and due to its small size compared to other Bermuda beaches, can get quite crowded in the summertime, especially around the Cup Match holiday, a two day public holiday held on the Thursday and Friday before the first Monday in August. The adjoining Whale Bay Park is a popular camping site, and during this period can become a small village in itself! Whale Bay though is indeed a beautiful little beach and should be experienced. Historically Whale Bay gets its name from the fact that during Bermuda's fleeting flirtation with whaling, Whale Bay, due to its proximity to the South shore whaling grounds and shallow water, made it ideal for the butchering of the whales. The whaling industry didn't last long in Bermuda, and nowadays consists of whale spotting excursions during March and April when the whales pass by close to Bermuda on their migratory routes. 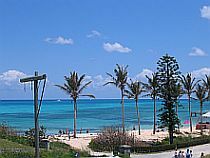 A five minute ride by taxi or moped and 15 minutes on the number 7 bus will bring you to a gem of Bermuda beaches, Elbow Beach. Elbow beach is half owned by the Elbow Beach Hotel and half public. The public side is the western end of the beach, though there is nothing to stop you venturing to the private side and hiring a jet ski or other water toy, or slipping up to Mickey's, a nice beach side restaurant, for a bite to eat. Elbow beach is great for swimming, and is also popular with kite-skiers, who add an extra dimension and entertainment for beach goers. You usually can spot a volleyball game going on at Elbow, and they're always happy for you to join in! 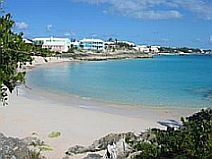 I spent many days of my childhood, teen years and adult days at John Smith's Bay located in Devonshire parish on Bermuda's South Shore. Getting here is easy either by moped, taxi or the number one bus. It’s about a fifteen minute ride east of Hamilton, Bermuda's capitol and, really only city. John Smith's is another beauty among Bermuda beaches, and makes for great swimming and okay snorkeling. It's not the best place to snorkel, but you can snorkel there, it's just a matter of swimming out a good way to see anything worthwhile, so this particular activity is only for strong and experienced swimmers and snorkelers. There is usually a snack wagon parked at John Smith's where you can get hamburgers, fish cakes, sodas and chips etc, and the hamburgers and fish cakes can be some of the best you'll find in Bermuda, usually home made, well-seasoned burgers fashioned from ground meat as opposed to patties, and freshly made fish cakes from Cod, yum! A secret I probably wouldn't share with you if I still lived in Bermuda, Hog Bay Park beach takes some effort in getting too, but once there it is usually yours exclusively! 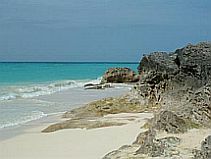 The unique thing about Hog Bay Park beach is that as Bermuda beaches go, it is still somewhat unknown! This is due to the fact that you must traverse rocky and wooded trails to get to it, and it is only a beach at low tide, therefore only enjoyable for about four hours a day. But for us, that is a long enough time to spend out in the sun anyway, and we enjoyed the walk through the trails. One of our favorite things to do at Hog Bay was to beach comb. 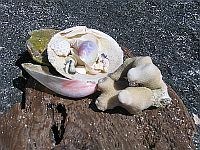 We have found an amazing array of rare and unique seashells there, as well as some really cool looking pieces of driftwood which I usually supplied to my neighbor as decoration for his fish tank. Depending on the time of year, there can be many sea urchins at Hog Bay, so some kind of footwear or fins is recommended, but for a romantic, private getaway, contact me for directions! Located in St.Georges, Tobacco bay is an ideal location providing fun for the whole family, you'll find everything you need for a fun day at the beach here. There is snorkeling and snorkeling equipment rental, a restaurant and bar, umbrella rental and music! The water is shallow and protected and so makes for calm, tranquil swimming-ideal for the kids. The snorkeling is excellent and atmosphere friendly and casual. The only downside is that it is one of the smallest of Bermuda beaches, so a "place in the sun" may be hard to come by during peak season. Solution; come early! A stone's throw away from Tobacco Bay (literally, I threw a stone the distance) is St.Catherine's beach. It is here the first settlers to Bermuda arrived ashore from their shipwrecked vessel the Sea Venture under the direction of Admiral Sir George Somers. Located alongside Fort st. Catherine (open to the public) and adjacent to the St.George's Club Golf Course, a nice little 18 hole par 64, St.Catherine Beach is also a great place to cool out and makes fro another unique beach experience. Very popular with locals, they have a bar and restaurant as well as hire out water toys here. 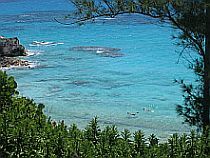 Because it is situated on Bermuda's North Shore, it is very shallow and calm as are all the North shore Bermuda beaches, and is also good for swimming and snorkeling. There is very much a party atmosphere here and consequently houses a young crowd. If you like sipping Pina Coladas while boogying to pulsating rhythms, this is the place for you. When the sun goes down, or you tire of the beach, Blackbeard's Tavern, a popular local pub and restaurant is only 100 yards away. 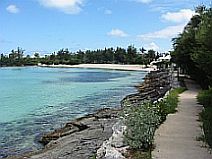 A quiet family beach, Shelly Bay is another of the North shore Bermuda beaches. Its name is derived from the high shell content of its white sands. Shelly Bay is also ideal for families, as one can stand in the water due to its shallowness, hundreds of yards from shore. There is also a playground for children in the Shelly Bay Park which borders the beach, and a small, though somewhat inconsistent in its opening hours, restaurant and bar. Shelly Bay is located just outside of Flatt's Village, the home of Bermuda's Aquarium and Zoo, and is accessible by several bus routes. These other Bermuda beaches are also great for swimming and/or snorkeling. Grape Bay is half public and half private. The beach is leased by the Grape Bay Hotel and Beach Club, but locals in the area have access to this gem. It's especially great for body surfing, as in plkaces some excellent swell moves in. Other areas of the beach are nice and calm, and there are even some kiddie pools where you can wade with younger children. 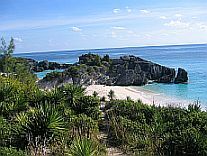 This beauty amongst Bermuda beaches is located in Paget, about a five minute drive or 10 minute bus ride on any bus heading westward. The property of the American Consulate borders this beach, and any local will be happy to give you directions.